Researchers believe that Twitter can not only help track food trends, but help analyze individuals' food preferences and habits. 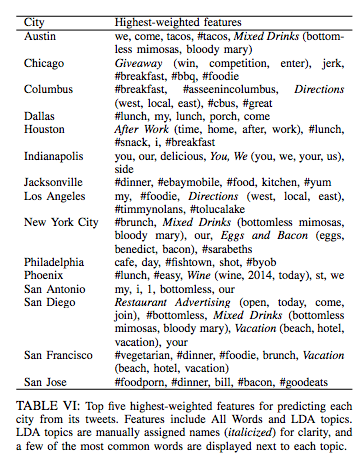 Researchers at the University of Arizona used Twitter hashtags to analyze what each state’s most popular foods and food topics are. We’re not surprised that Wisconsin apparently likes to talk about sauerkraut, or that Texas loves its brisket. But who would have thought grits would be such a popular topic of conversation? Also, it’s worth mentioning that these foods are “popular” in the sense that they’re mentioned a lot—but without context, we wouldn’t necessarily claim those foods (or, in the case of “capers,” non-foods) are any state’s favorites. The Twitter4Food team has released their paper online, along with an interactive tool you can use to create graphic visualizations of the Twitter data they gathered for analysis (the researchers combed through 3.5 million food-hashtagged tweets pulled from Twitter’s API between October 2013 and May 2014). After gathering this information, the team attempted to predict certain things about each state—including obesity rates and political leanings. Full findings are all detailed within the paper. 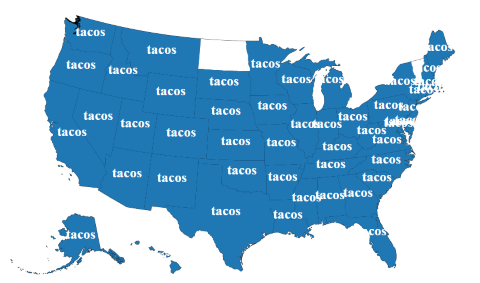 Playing with the interactive data visualization tools revealed at least one universal truth: everyone loves tacos. Well, except North Dakota and Vermont, apparently. 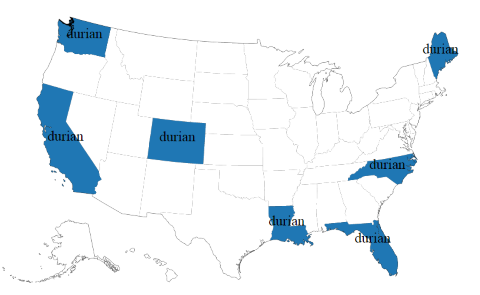 We were also intrigued by Maine’s apparent durian fascination, and wanted to see just how deep that spiky, notoriously-stinky fruit love goes elsewhere in the nation. 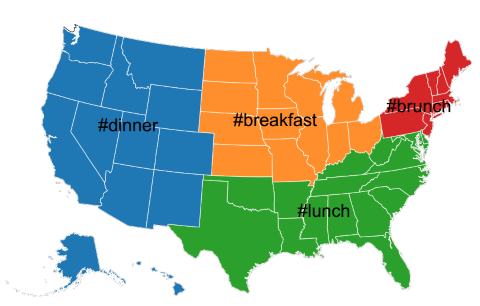 The Twitter results also revealed that each part of the nation has a definite favorite mealtime that it likes to tweet about. We suddenly have the urge to map out the rappers who spit these brunch lyrics and see if they match up in any way with the map above.